Woodworking is about two things; your craftsmanship skills, and your tools. 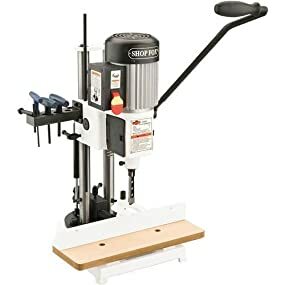 Here’s the thing; even if you have a great compound saw and an excellent drill, you still need to get them mortises done in a perfect manner, and what’s better than getting a good mortising machine for that purpose? When mortising machines were invented, woodworkers rejoiced all over the world as such devices can take care of all the heavy lifting when it comes to making mortises in a more accurate manner. As we know that making a choice isn’t easy when it comes to power tools, we decided to round up the best mortising machines available today and review them for you. Without further ado, let’s get to the list. What Are Mortising Machines Used For? What Are the Different Types of Mortising Machines? What Should You Look for When Buying a Mortising Machine? Jet JBM-5 Bench Mortiser Benchtop Chisel Shank Capacity: 5/8", 3/4"
Powermatic PM701 Bench Mortiser Benchtop Chisel Shank Capacity: 3/4"
Makita 7104L Chain Mortiser Chain Mortiser Max. Hole Width (longitudinal): 5-1/8"
Max. Hole Width (transverse): 1-1/4"
DELTA 14-651 Bench Mortising Machine Benchtop Chisel Shank Capacity: 5/8"
Powermatic Model 719T Tilt Table Mortiser Tilt Table Chisel Shank Capacity: 5/8", 3/4", 1-1/8"
Shop Fox W1671 Mortising Machine Benchtop Chisel Shank Capacity: 5/8", 3/4"
As the name strongly suggests, mortising machines are used to make – hey, surprise! – mortises. As you probably know, mortising is the act of putting a hole into wood or any other material in which a tenon can fit. 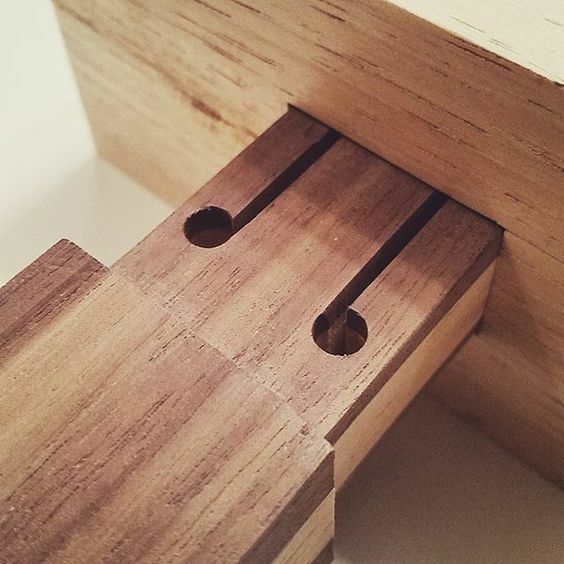 The mortising act is usually used by woodworkers to connect two pieces of wood together at a 90-degree angle. When a woodworker needs to attach a leg to the top of a table, for example, he can use a mortising machine to drill a hole into the piece of timber, and voila! The table is ready for the dinnerware! 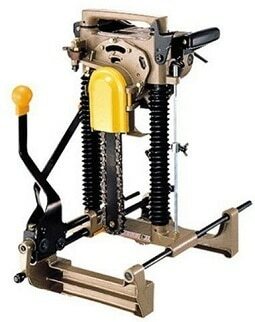 To create a perfect hole inside which the tenon can fit, the woodworker needs to attach a drill bit – for which the type depends on the task at hand – to the motorized rotator of the mortising machine, then turn the mortiser on and stand back as it creates a symmetrical hole that’s ready for the tenon. Have you ever used a drill press before? If you did, you’d feel right at home when using a square chisel mortiser, as they’re pretty similar. 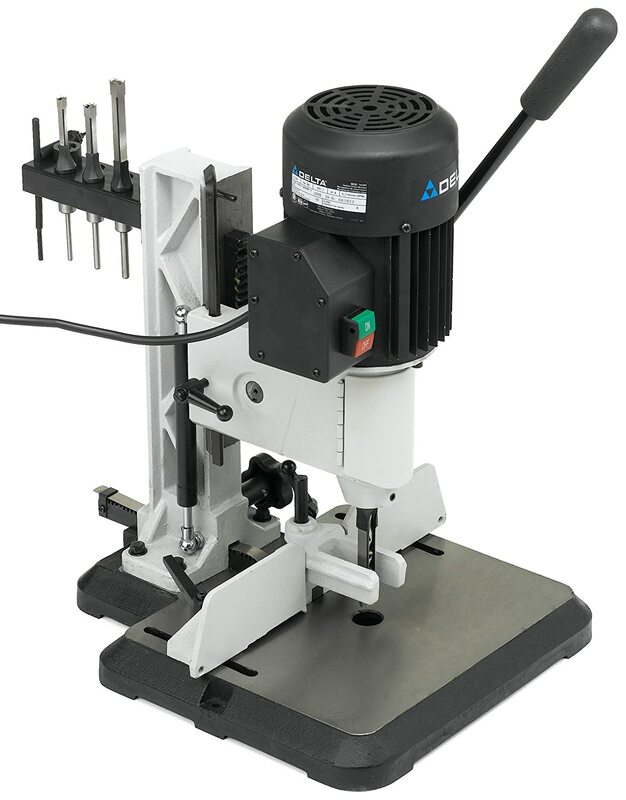 As a matter of fact, square chisel mortising bits can be attached to drill presses through a mortising attachment. 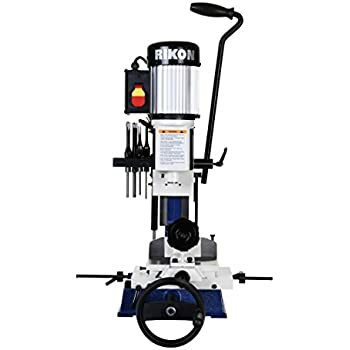 The square chisel mortising machine harnesses both the power of a four-sided chisel, which keeps the edges straight and clean, along with the action of the drill bit, which clears out of the material, to create clean, symmetrical holes. 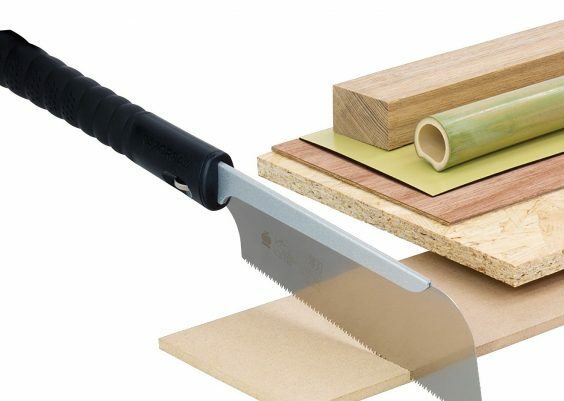 If you need something to tackle loose or floating tenons, which are created when you need to attach two pieces of wood using a third piece, then horizontal mortisers are the way to go. Horizontal mortising machines boast a router that’s mounted on the side along with a workpiece that’s attached to a multi-axis sliding table. Although they can be used to create the regular mortise and tenon pairs, they’re better suited for floating tenons mentioned above. Chain mortising machines are suitable for large projects, such as creating large mortises for timber frame construction. This model uses a chain with cutters that plunges into the workpiece successively to mortise out the required volume. A personal favorite of ours for a good number of years, the Jet JBM-5 mortising machine wins you over with a plethora of functionalities and features that come at an affordable price. Although Jet is not as well-known as other brands on our list, the JBM-5 mortising machine proves that this manufacturer can indeed produce some fantastic power tools that will cost you neither an arm nor a leg. Jet’s JBM-5 mortiser looks pretty neat from the outside, but there’s more to it than meets the eye. It packs a powerful 0.5-HP powered induction motor that’s clocked at 1752 RPM, which means that this tool guarantees a tension free operation. As a woodworker, you should understand the importance of power in your devices, and JBM-5 excels in that aspect. Even though this power tool weighs a whopping 44 pounds, operating it is as easy as it gets. It features a mechanism to sift in reverse at the heavy-duty, cast-iron base, which means that it makes long stock mortising a breeze. When you need to change the bits simply flip open the doors through which you can access the chuck. 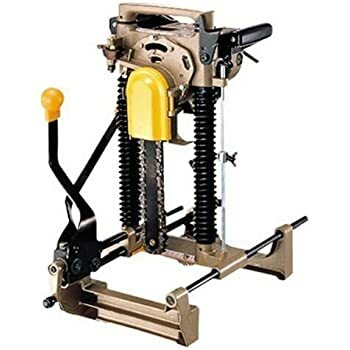 To keep the user safe and sound while crafting his or her mortises, the JBM-5 mortising machine sports a quick-setting depth stop along with a removable toggle switch, both of which can prevent unauthorized or accidental use of the power tool. Despite its many perks, there are a few niggles with this device. The cast iron table may prove to be somehow small for some users. Also, the adjustable fence’s design isn’t as well-thought as it should be. The Jet JBM-5 mortising machine is an affordable power tool that can get the job done and create clean mortises without leaving too much mess, all while keeping the user safe all the way through the mortising act. Granted, it does come with a few compromises, but for the price, there’s no arguing over the quality of this mortising machine. 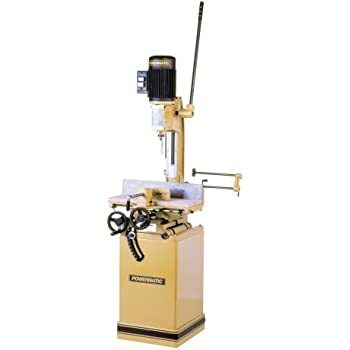 A few years ago, Powermatic shook up the woodworking market with their innovative, powerful devices, and they’ve recently expanded the line to the mortising machine world. The PM701 mortiser from Powermatic differentiates itself from the other products on our list by offering a middle ground solution when it comes to the price while providing high-end performance. Powermatic’s heavy-duty mortising machine harnesses the power of a 3/4 horsepower, 115-volt motor that runs at 1725 RPM to create clean, symmetrical mortises every time you turn the device on. Not only are they clean though, but also highly precise as this mortiser boasts an in-line depth stop that allows users to stop at preset depths without necessarily racking the mortiser bit to the base. Another feature that we really like is the double lock system, which is designed in a way that one lock locks from the top while the other takes care of the side, thus ensuring zero-slippage when removing the chisel from the wooden piece. To operate this power tool, the user – aka you – uses a heavy-duty, reversible handle, which is quite durable and can take a beating while being versatile as it can be switched it from one side to the other without any extra tools or assistance. 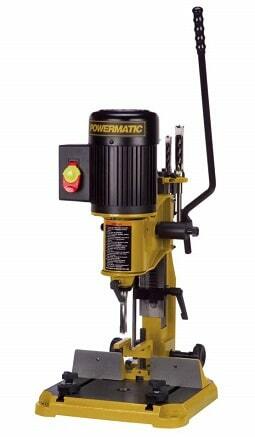 Additionally, Powermatic PM701 comes with a sizeable hinged chuck door that allows easy access to the drill chuck using a 4-inch chuck key. Quite the easy-to-use machine, isn’t it? Powermatic’s PM701 Mortiser is a reliable power tool; however, it’s not without drawbacks, irrespective of how minor. First, the surface of the work table and the fence isn’t the most aesthetically-appealing out there. Second, the handle may cause some discomfort to certain users, but that doesn’t mean that it’s any less adjustable. As with the Jet JBM-5 mortising machine reviewed above, the Powermatic PM701 comes with several features that allow for a great mortising experience. It has a higher price point; there’s no denying that, but it’s worth every penny. Makita has been in the power tool business for years, and they’ve certainly learned a thing or two during that time. The Makita 7104L 10.5 Amp Chain Mortiser has a steep price point; there’s no denying that, but considering everything you’re getting and the fact that’s it’s a chain model, there’s really nothing to complain about. Makita’s chain mortiser comes with everything you need for your timber framing tasks, including an 18-mm chain, sharpening holder assembly, chain oil, and wrench. The main unit packs a robust 10.5-AMP motor that’s clocked at 3,200 PM, which is more than enough to drill clean holes into the thickest of wood pieces, especially that the included chain is razor sharp and can cut through virtually anything like butter without burning or damaging the lumber piece. This high-end mortising machine can pivot to three cutting positions without resetting the base. Furthermore, the levers and knobs can be adjusted to re-adjust the position of the chain across the timber. If that’s not convenient, I don’t know what is. Makita is a well-reputable brand, so you should expect nothing but quality when getting a power tool from this manufacturer, and that’s exactly what you’re getting in the 7104L 10.5 Amp Chain Mortiser. The high price point is justified by the great features and high quality this device offers, which is why we can confidently recommend it to any homeowner or professional willing to pay what it takes to get the highest quality. The formula isn’t revolutionary—a powerful motor with heavy-duty construction—but the result is pure mortising efficiency. 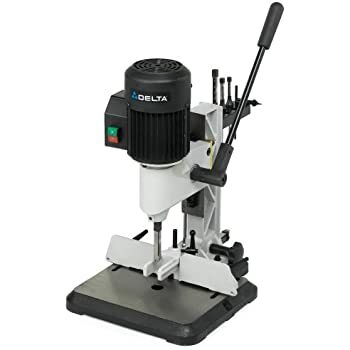 Most importantly, the Delta 14-651 Mortising Machines weighs only 77 pounds and features a cast iron base that’s capable of taking quite the beating, which is why the Delta Mortiser holds a special spot on our list. Delta’s mortising machine looks nice, and it performs nice as well. It boasts a 1/2-horsepower, 120-volt, 60-hertz, single-phase induction motor that can rotate the spindle at 1,725 RPM. A bit slow? Maybe, but that doesn’t mean that it’s any less capable than any other power tool on our list. The slow speed means that you won’t experience any overheating whatsoever, and it guarantees that your workpiece will remain safe and sound throughout the operation. As with other mortising machines on our list, this device features an adjustable depth stop, which ensures that your cuts will be accurately measured every time. The Delta mortising machine offers plenty of customization options. The head mount can be adjusted 180 degrees or removed if needed, the rack-and-pinion fence system and the head are easily adjustable and can be put wherever you need them, and the dovetail is adjustable for convenience and ease of use. Mr. Beginner-friendly much? 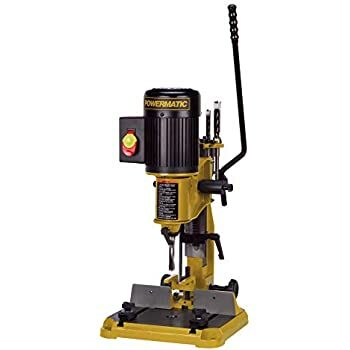 The Powermatic 719T mortising machine comes from the expensive side of the spectrum, though the high price is justified as you’re getting more than just basic functions in this power tool. The tilt table mortiser form Powermatic features heavy-duty, cast-iron construction with a massive rack-and-pinion gear system and a spring-loaded, adjustable handle that can be altered in six positions. Coupled with the extremely-powerful 1-HP motor, the unit can get any mortising task done with ease. Powermatic describes the 719T machine as a “high-tech joint building lab.” Why is that? Because it’s designed for big mortising projects, not small, DIY ones. The feed lever can be adjusted in six positions, the entire table can tilt from 0 to 35 degrees, and the rack-and-pinion system is gas-powered. All of that means that this mortising machine offers excellent versatility and can be used for a wide range of angles and wood sizes. Unfortunately, this mortising machine does not come with chisels, which means that you’ll have to get your own. Besides looking good, the Shop Fox mortising machine offers some pretty neat functionalities. 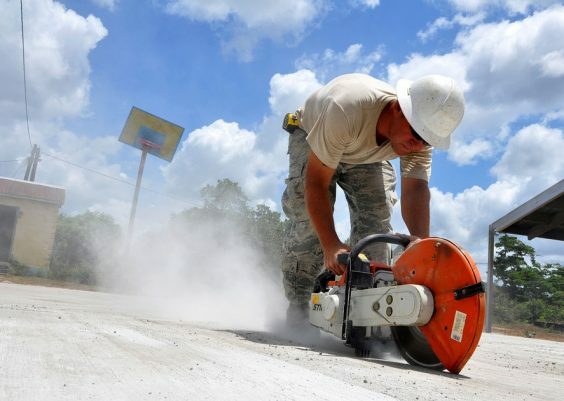 What’s impressive about this power tool is that despite the low price tag, it packs all of the features you’d expect from a high-end product, including rugged construction, high-quality materials, and smooth operation. Starting with the construction, Shop Fox’s W1671 mortising machine sports a swiveling base that makes it suitable for both bench and off-bench tasks along with a heavy-duty, cast iron fence that ensures a fast, accurate operation every time you turn on the machine as it can hold down and prevent any unwanted, annoying wood movement. Talk about a powerful combo, huh? For power, this mortising machine packs a 3/4 H.P. motor clocked at 3450 RPM, which means that it can pierce through both hard and soft lumber pieces with ease. Thanks to the high-speed direct drive operation, you needn’t worry about overheating or burning out the wood as the cutter gets in contact with the workpiece for short periods successively. The handle in Shop Fox’s mortising machine is extra-long, and it can be adjusted to six positions to prevent leverage while you’re drilling into the wood piece. Other features include a quick-adjust depth stop with a positive stop mechanism that ensures great accuracy, a quick-setting handle that can make the mortising task easier, and a reliable rack and pinion elevation system that makes for a personalized experience. As with any affordable power tool, it’s normal to expect some niggles with the Shop Fox W1671 mortising machine. Nothing major, thankfully, as the drawbacks boil down to the cheaply-made knobs and the not-so-easy-to-understand user manual. Other than that, this mortiser definitely lives up to the price and brand’s reputation. 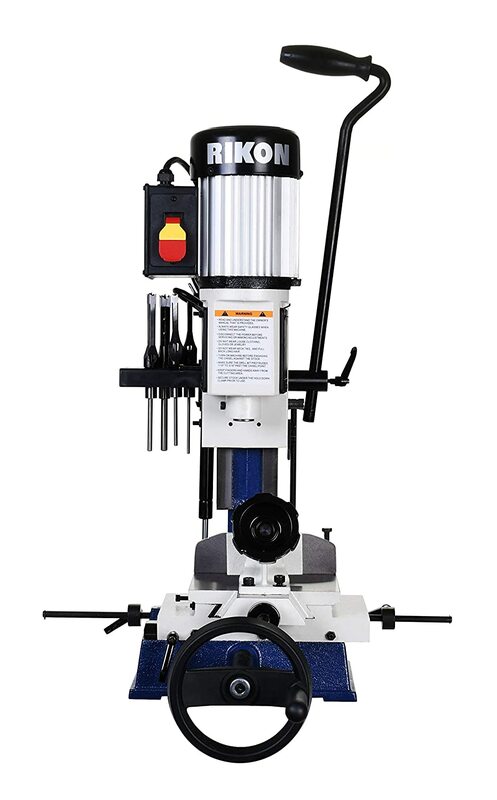 The RIKON 34-260 is yet another heavy-duty mortising machine that offers a plethora of features without costing a fortune. First, the design is as ergonomic as it gets. The unit is made in a way that allows for excellent control over the positioning of the mortises. Besides, RIKON’s mortising machine offers plenty of space for all of your workpieces on the table and the table extension, and it comes with X-Y coordinates for accuracy. The motor isn’t the most powerful around, as it packs ½ HP, but it can get the job done just fine with no overheating or unwanted mess whatsoever since it can rotate the spindle at a decent speed of 1,700 RPM. Along with the main unit, you’ll get a fence, hold-down, tool holder, and four chisels. Just assemble the lot together, and you’ll be making precise mortises in no time. The only thing that the users of the RIKON mortising machine complained about is the user manual, as it’ s hard to understand. Let’s be honest though, who reads user manuals when you can check video tutorials on the internet? 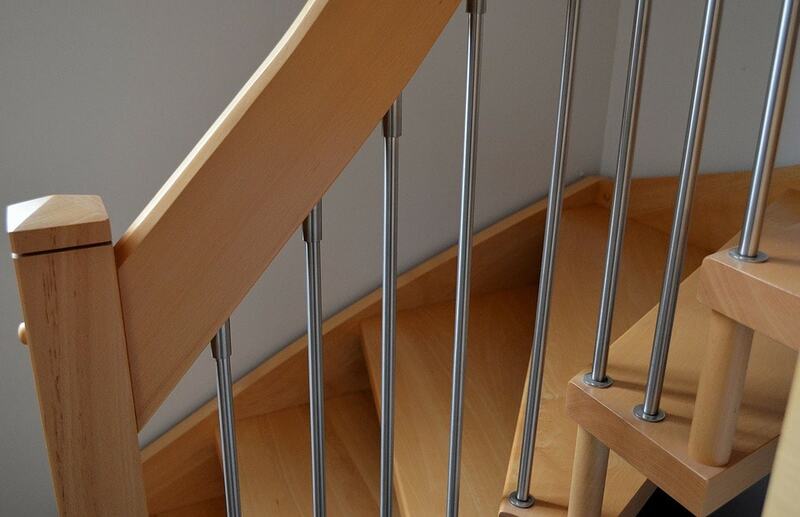 Wood joinery involves in joining wood pieces together such as this staircase. Mortising machines are used for this kind of job. When choosing a mortising machine, or any other power tool for that matter, you should be extra careful as many models are more of a hit or miss. There are several features to look for and various factors to consider, which we rounded up for you to make your choice as sound as possible. Mortising machines come in two models; either freestanding or benchtop. Freestanding machines are on the heavy and bulky side of the spectrum. They require some space in your workshop or garage, so they may not be an ideal choice for hobbyist woodworkers. However, due to their size, added features, and sophisticated adjustments; benchtop mortising machines are the best suited for bigger jobs requiring angled mortises, long strokes, and increased accuracy. 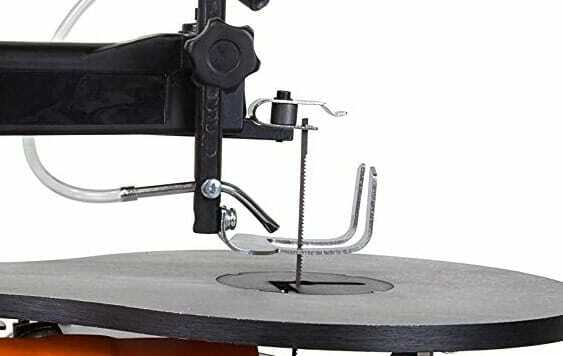 Benchtop mortising machines, on the other hand, are smaller and cheaper, making them the obvious choice for hobbyists and occasional woodworkers. Years ago, mortising machines used to have highly-clocked motors, with speeds that got up to 3450 RPM. Today, mortisers are slowing down, and while that may seem like a downgrade, it’s actually a sound measure that aims at preserving your chisel sets and increasing their lifespan. Additionally, slower mortising machines are easier to use and more suitable for beginners as they don’t overheat as much; neither do they produce a lot of noise and smoke. On the flip side, slower mortising machines, such as the RIKON Professional Power Tools Benchtop X/Y Mortiser reviewed above, take more pressure to get perfect mortises every time, which means that you’ll have to decide whether you prefer speed or comfort before picking your mortiser. The chisels are as important as the actual mortising machine, that’s why you need to pay special attention to the chisel capacity before picking your power tool. Most benchtop models can take up to ½” x ½” chisels, but some models can take up to 5/8” and 3/4” mortising chisels. Besides checking the capacity, you also need to make sure that changing the mortising chisels is easy before going with a device or the other. Efficiency is key in woodworking, so go over all the details before making your choice. When checking the fence system, look for one that’s large, as the larger, the better in this aspect. Also, look for a fence that’s either flat across the face or 90° to the table, as those are the most efficient. The handle may not seem like a big deal when getting a mortising machine, but it actually is one. As a general rule of thumb, the longer the handle, the less pressure you’ll have to apply, and therefore the easier the operation. That especially applies if you get a slow speed mortiser as they require more effort. There are many ways to go when trying to create a mortise, but nothing can rival a good mortising machine. Whether you’re a hobbyist or a professional, you can never go wrong with such a power tool, as it can make your journey much easier and take care of a great part of hand work. 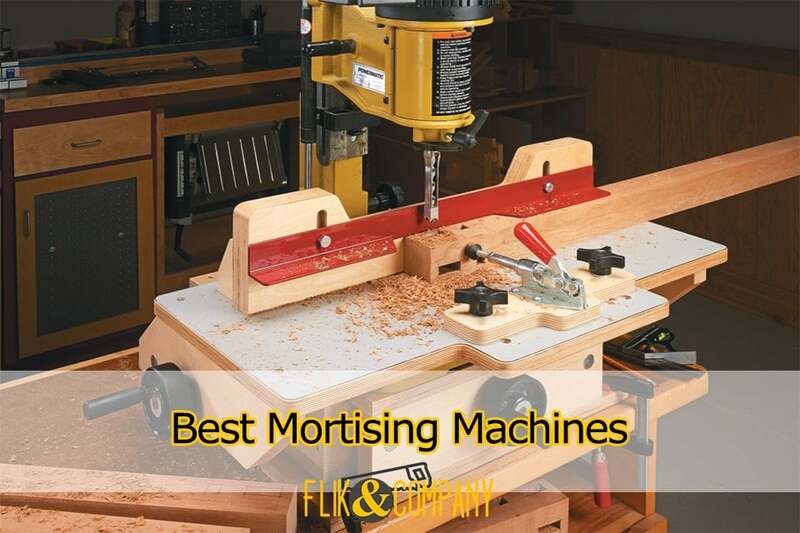 Depending on your needs, level of expertise, and experience as a woodworker, any of the above recommendations can be the best mortising machine for you. To make the right selection, don’t forget to determine your budget and decide which elements are most important for you.